SiteLab is a registered US trademark by flow measurement professionals with more than 37 years of experience in flow measurement and flow standards, 34 years of which have been in the ultrasonic flow measurement field. Clamp on and Wetted Sensor Transit Time Flow meters. The SL1188 ultrasonic flow meter incorporates the latest developments in digital signal processing to deliver highly accurate and repeatable flow measurement for a wide variety of liquids and pipe sizes. It has sophisticated electronics coupled with powerful ultrasonic transducers to make this universal transit-time flow meter the top choice of industry leaders. 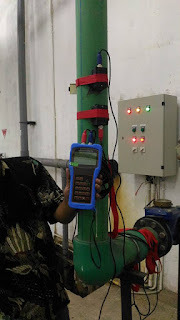 The SiteLab SL1168P Portable Digital transit time ultrasonic flow meter provides a measuring system with excellent accuracy, versatility, ease of use , and dependability. This universal meter features a pushbutton interface, ergonomic handheld design and a large digital display that significantly simplifies set-up and data collection. Although designed primarily for cleaner liquids, the S1168P can reliably measure liquids containing moderate amounts of suspended solids. Its high-powered ultrasonic pulse with improved digital signal processing requires just one set of transducers for a wide range of pipe sizes and materials including metal, plastic and concrete.